Thank you for the book Alexander. I’ve read it with great pleasure, many ideas coincide with mine, some are opposite, and in general the book is magnificent. I particularly liked the tale about a flat in Klin, I have been there once and impressions are very lively. I completely agree, in business one should act creatively different and that is true: “there is enough way for everyone))), the main thing is to meet on this way a good mood, a good cheer and a kind heart. The book is super. Great, that there are people, ready for new achievements every minute. I will keep my fingers crossed for Alexander Kravtsov and his team. 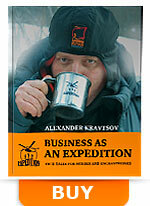 I liked the book, particular thanks for the principle of “immediate evacuation”. It saves time, money and nerves. I’ve read the book from the title till the end within several hours. I appreciate the author’s honesty, because I’ve found for myself answers for many questions. In particular, about interaction with partners and opportunities for expanding business. Wishing further success and prosperity. I’ve received one more evidence, that successful business is built up by people with creative different thinking. © Copyright holder: "Ruyan" company. All rights reserved. When using this website content, the link to the source is mandatory.